This large property is next to the A6 at the southern end of Matlock Bath and overlooks Masson Mill on the opposite side of the road. It was built by John Edward Lawton, a Cotton Manufacturer from Manchester, who was in partnership with Frederic Charles Arkwright at one stage. Although their partnership was dissolved in 1890, Lawton continued to work at Masson Mill. He couldn't have chosen a better spot to watch over the mill workers' every move. Woodbank was designed for Mr. Lawton by Mr. Stott of Manchester; it had been planned with every modern convenience including a bathroom for nearly every bedroom. It was also said that no expense was spared in the construction. The grounds are extensive and include are 2 large caves, as well as woodland and formal gardens. John Edward Lawton had clearly built to impress as the house had over 20 bedrooms in 1911 when bathrooms were converted to bedrooms once it became a holiday centre. There were said to be over 30 bed and dressing rooms in 1917 and eventually the number was said to have increased to 56! Yet in 2018, when the property went to auction, the number of bedrooms in the main house were just 25. The Lawton family arrived in Matlock Bath some time between 1887 and 1891, although the web mistress has found a variety of suggested dates prior to 1887. Before then he was described as both a Cotton Spinner and a Yarn Agent; he and his partners had business premises in the city of Manchester at 3 Macdonald's-lane and 19 Cannon-street. In 1874 Mr. Lawton was named as secretary to Shaw Hall Spinning Company, Mottram Road, Shaw hall, Newton moor, Cheshire. The Lawton family lived at Dukinfield in a house also called Woodbank and they seem to have continued to own the property after moving to Matlock Bath. In 1897 Masson Mill became part of the English Sewing Cotton Company. By the 1901 census, when he was nearing the end of his tenure at Masson Mill, Mr. Lawton described himself as "Managing Director Sewing Cotton Co.". He is known to have lived at Woodbank until at least 1908 although his association with Masson Mill had ceased some years previously. In late November and early December 1910 the "costly contents" of Woodbank were auctioned at the mansion by the London auctioneers Knight, Frank and Rutley. Woodbank was subsequently let to Mrs. Wood, the mother of Mr. S. Hill Wood who was the M.P. for the High Peak, though the lease was re-assigned the following year. The Co-operative Holidays Association leased the mansion in June 1911 and Miss Panton-Ham was the manageress in 1912. It was still called Woodbank in 1916, when Miss Brill was manageress, but after that it was no longer advertised in the trade directories. The house was renamed Cromford Court in the 1930s and has retained that name ever since. In the khaki election of 1900 Mr. Lawton, who was Chairman of Matlock Bath & Scarthin Nick UDC for about sixteen years, stood as the Liberal candidate in Salford. On the eve of polling day he apparently imported a huge elephant into the constituency, decked in Liberal colours. The elephant enlivened polling day, but was unable to sway the result and Mr. Lawton was defeated. Julie Bunting recounts a story of Mr. Lawton's authoritarianism involving the lavish wedding of his daughter Mary to Hugh Crawford, a Scottish manufacturer, at Holy Trinity on 19 Jan 1898. Apart from insisting the workers wore suits to go to the "toast" at the Palais Royal, Julie writes that three foremen counted the minutes they were away from their work. This differs somewhat from the account in the local press (below) as Mr. Lawton was roundly cheered. The marriage of Miss Lawton, Matlock Bath. Continued festivities. Without Lawton's energy and drive, and the formation of the English Sewing Cotton Company, perhaps Masson Mill would not have survived as a major employer in Matlock Bath until well into the twentieth century. Mr. Lawton passed away at Buxton in February 1915 and was interred at Dukinfeld. During the Second World War soldiers were billeted in the house but the house had suffered years of neglect when, in 1980, the New Tribe Mission became the owners and used the property as a Bible College for almost two decades. It is now under different ownership. 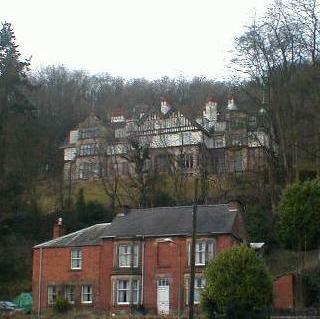 "Woodbank, Matlock Bath". No publisher. No.0410. Not posted. 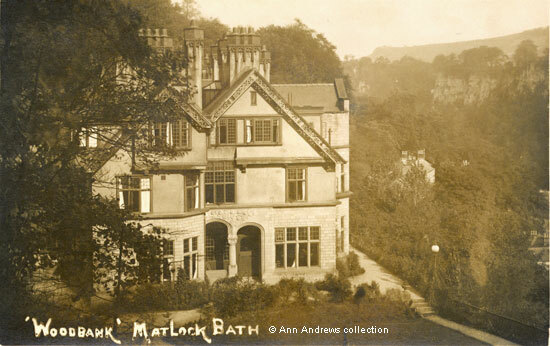 "Matlock Bath, Cromford Court Guest House", published by F. Frith & Co., Ltd, Reigate. M T B 18. No date. 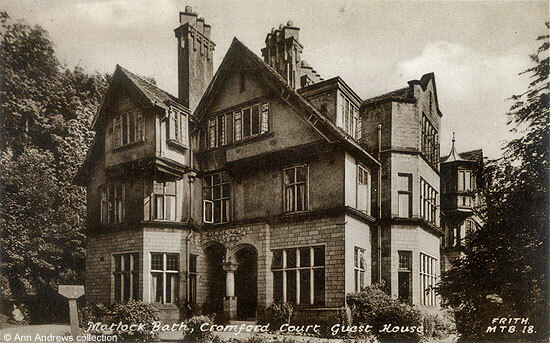 There are several similar postcards of Woodbank / Cromford Court. Photograph taken by undisclosed contributor. "The London Gazette", various entries. "Derbyshire Advertiser and Journal", 12 February 1915. Death of Mr. Lawton of Matlock Bath. "Derby Daily Telegraph", 25 November 1910. "Derby Daily Telegraph", 12 November 1910. Matlock Bath & Scarthin Newspaper Cuttings, 1899 has an article announcing his candidacy.